All these Erebia's have been photographed in the middle of August in Val d' Hérens (Switzerland) between approximately 1600 and 2400 meters. The Erebia above was flying among E. tyndarus. 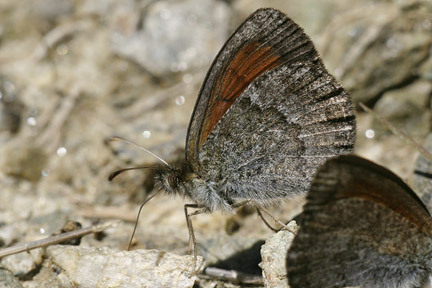 However it looks quite different, it doesn't have ocelli on it is upperside forewing and also it doesn't have the blue/greenish shine. 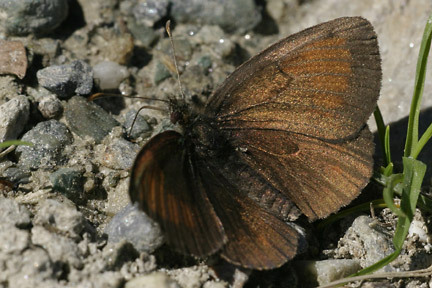 The underside hindwing is rather dull brown and has hardly any contrast. 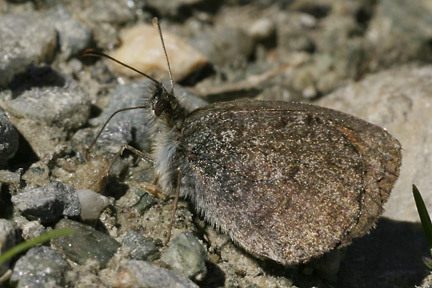 The sun shining on the left wing in the first picture suggests that there is a light band on the underside forewing. My first guess would be E. gorge forma erynis. Again a small Erebia. 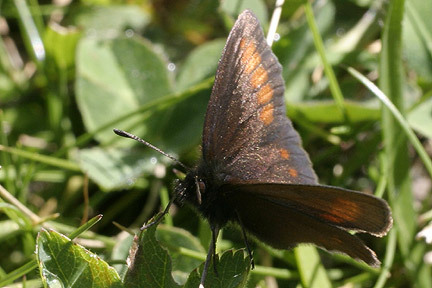 I think it isn't E. melampus because the ocelli are missing on the upperside forewing. And I think the forewings aren't round enough too. Maybe Erebia pharte??? Same reason as Erebia 003/004, the spots are missing. However the shape of the orange band is quite different compared to the former Erebia. On one particular path hundreds of small Erebia's were flying around. Most of them were E. tyndarus. But there were a lot of varations. 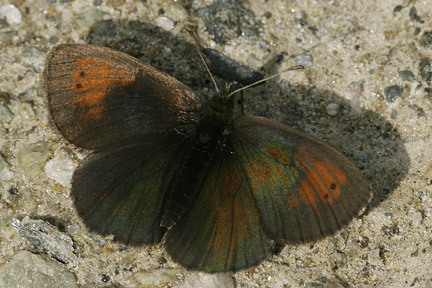 Some didn't have spots on the underside forewing. 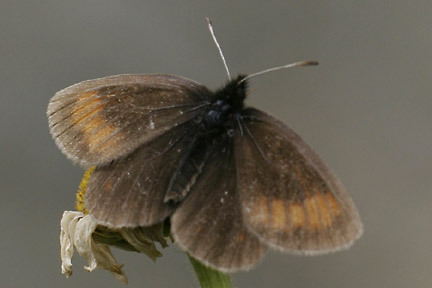 This one has no white spots in the ocelli on the upperside forewing. Still, I think this is E. tyndarus. This is probably yet another Erebia Tyndarus. 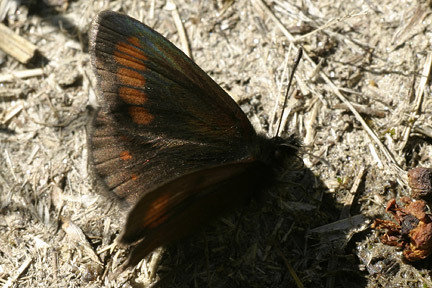 This time the spots are missing on th underside hindwing.